13:56 jonadab Which instructions are you following? 14:00 FreddyEnrique Is that a bad sign? 14:01 jonadab Hmm, I'm trying to find your place. 14:02 jonadab So I'm not clear on exactly where you actually are. 14:03 jonadab Ok, so, you're still installing OpenSRF, right? 14:04 jonadab I wouldn't expect the web/xul stuff to exist yet at that point, using the standard installation order. 14:04 jonadab That stuff's part of OpenILS itself, not part of OpenSRF, if I understand correctly. 14:04 jonadab OpenSRF is just a communications layer that different Evergreen processes use to talk to each other. 14:05 jonadab It's like an interprocess communications mechanism that provides network transparency, I believe. 14:05 jonadab It's built on jabber. 14:06 jonadab So yeah, I think you can continue to proceed for now. 14:06 jonadab If you can get to the point where the srfsh math test passes (you send an add request and get back the answer), then OpenSRF is installed. 14:06 jonadab At that point you can go on to installing OpenILS itself. 14:07 jonadab and/or other dependencies like Postgres, depending what order you're doing things in. 18:32 FreddyEnrique Or does it mean I hace to continue the evergreen installation? 19:28 jonadab Continue with the Evergreen installation. 19:28 jonadab I believe the web dir stuff comes from OpenILS itself, _not_ from OpenSRF. 19:32 FreddyEnrique the apache installation is before of after the the opensrf installation? 19:41 jonadab Either, I think. 19:41 jonadab But probably best install Apache before OpenILS. 19:42 jonadab Although, the prerequisites step probably does automatically, come to think. 19:42 jonadab Not sure if the prerequisites also picks up Postgres. 19:46 jonadab If you follow the instructions in the order in which they're written, it should all work. That isn't the only possible order or even necessarily the fastest order, but it's an order that works. 19:47 jonadab Some of the guys at the conference were saying that they like to change the order in some ways, e.g., I remember they said they create the opensrf user first and download everything _as_ that user, so then they don't have to recursively chown it all, which saves maybe a minute or so. 19:48 jonadab That sort of optimization is probably more relevant if you're installing a lot of times (e.g., for testing changes) and are familiar with the process and can move through the steps quickly. 19:49 jonadab BTW, this channel tends to be pretty dead on the weekends; I think a lot of the Evergreen folks don't irc at home. 19:49 jonadab Which is weird to me, I have IRC up _more_ of the time at home than at work, I think. 19:49 jonadab But that may be partly because it was the NetHack community that pulled me into IRC, and then I found #evergreen later. 19:53 jonadab Not a problem for me. 19:53 jonadab Like I said, I'm _usually_ on IRC at home (except when asleep). 19:54 FreddyEnrique forgive...what is.... IRC? 19:54 jonadab Internet Relay Chat? 19:54 jonadab The technology we are currently using to communicate. 19:54 jonadab Oh, I see, you're using the web interface. 19:55 jonadab I keep irssi running all the time in a screen session. 19:56 jonadab That way even when I go afk and detach from my session, people can still nickping me, and I get the hilights when I reconnect. 19:57 jonadab And backscroll, although I don't usually read the backscroll in busy channels like #nethack and #evergreen. 20:01 jonadab email is convenient for situations where you want to be able to think for a while about each reply. 20:02 jonadab But IRC tends to be better for starting a conversation and getting a bunch of answers quickly. 20:03 jonadab Although the threading aspect of email can be good if the answers are going to be long. 20:03 jonadab It just depends what you're doing, I guess. 20:04 jonadab If you want the worst of both worlds, there's always reddit or, heaven help you, Discord. 20:05 jonadab Yeah, I don't know if the web interface does logging. 20:05 jonadab A real IRC client would, of course. 20:06 jonadab Although #evergreen is publicly logged. 20:06 FreddyEnrique wait....a real IRC doest need a interface? 20:07 jonadab Real IRC clients have interfaces, of course, but they're not built into a website. They're actual applications. 20:07 jonadab weechat is probably the most highly recommended. 20:08 jonadab I use irssi mostly because I was already using it before I found out about weechat. 20:08 jonadab I think weechat is newer. 20:09 jonadab IRC has been around a long time, so there are dozens of IRC clients. 20:09 FreddyEnrique but...why this method and not a group in facebook or those commonly used social platforms? 20:09 jonadab hexchat, chatzilla, xchat, mIRC, I don't even know what they all are. 20:10 jonadab FreddyEnrique: Facebook is completely inappropriate for several reasons. 20:10 jonadab 1. It's an inappropriate place to put anything that needs to be reliably public. 20:10 jonadab 2. It's equally inappropriate for anything that needs to be private. 20:11 jonadab 3. It's not _intended_ for this sort of thing, and it shows. 20:13 jonadab IRC has been around for a very long time (it's older than the web) and is firmly entrenched in technical circles, especially among open-source developers. 20:13 jonadab Most serious open-source projects have a channel on Freenode. 20:14 jonadab The answer to "why IRC" is "because that's what everyone uses, except for the people who can't decide and keep switching communications platforms every five years." 20:15 jonadab No, I didn't say older than the internet. I said older than the web. 20:15 FreddyEnrique do you recommend to install the application? 20:15 jonadab If you're going to be sticking around long-term, then yes. 20:16 jonadab If you're only here for a couple of days to do this one install, then maybe not. 20:17 jonadab I didn't get on the internet until 1994. 20:19 jonadab Yeah, I'd expect it to have arrived down there somewhat later. 20:19 jonadab Maybe '96 or so? Guessing. 20:20 jonadab I'm in the States, and almost all colleges up here had internet by 1995. 20:20 jonadab Major universities had it in the seventies. 20:20 jonadab After a fashion. I mean, it wasn't the same as now. At all. 20:21 FreddyEnrique have you heard of that software? 20:22 jonadab But I come from the IT side, not from the library side. I mean, I work at a library, but my schooling wasn't library-related at all. 20:23 jonadab I didn't get the job at the library until 2000. 20:24 jonadab So I don't know all the library stuff. I mean, I know what MARC is, but if you start throwing around specific tag numbers, my eyes will glaze over _fast_. 20:24 jonadab Eh, that's relative. 20:28 FreddyEnrique Then... Let me ask you a question... Why Evergreen? 20:30 jonadab Speaking only for myself: I prefer open-source solutions for several reasons. 20:30 jonadab 1. It's generally a lot easier to figure out what's going on, troubleshoot problems, etc. 20:31 jonadab When you have a problem with a proprietary black box, you're helpless to do anything but call the vendor and describe the symptoms, and you don't necessarily know even where to look for clues. 20:31 jonadab I hate that. 20:31 jonadab 2. The community support tends to be a lot better, especially if you're small. 20:32 jonadab 3. Features that a lot of users want are WAY more likely to get implemented in the open-source world. 20:33 jonadab Speaking about ILS software in particular, we've used two different proprietary solutions in Galion. 20:33 jonadab The first was reliable, but its UI left a lot to be desired. 20:33 FreddyEnrique waaaa.....what are those calendars??!!! 20:34 jonadab The second has been a nightmare. 20:34 jonadab FreddyEnrique: If you click on a date, it shows you the log of this channel from then. 20:35 jonadab Yes, we migrated in 2005. 20:35 jonadab The first one was really showing its age, and the vendor was encouraging everyone to move to their newer product. 20:36 jonadab The second one has been a large disappointment. 20:36 FreddyEnrique Oh.... Its wasnt Aleph right? 20:36 jonadab Galaxy and Polaris, respectively. 20:36 jonadab That's what we moved to in 2005. 20:37 jonadab We actually had three systems demoed (Polaris, Library.Solution, Horizon). 20:38 jonadab The staff all liked Library.Solution best of the three, by a wide margin; but we ended up going with Polaris because it was 2005 and there were budget cuts of unknown severity anticipated, and the Polaris quote, after the second round of negotiations, was about $10 thousand cheaper than the TLC quote. 20:39 jonadab The ILS software field was pretty broad and active around then. There were libraries in our area on everything from DRA to Millennium. 20:41 FreddyEnrique BTW, what type of library are you working in? Public? Academic? 20:41 jonadab We're an Association library, but our official service area is the city of Galion. Which has a population of about ten and a half thousand people. 20:42 jonadab Americans expect a lot out of their libraries. 20:43 jonadab We have to always have all the latest movies and popular books (in regular, large print, audio, ...), etc. 20:43 jonadab And lots of internet computers so nobody ever has to wait, and so on. 20:50 jonadab Perhaps Americans are also a bit spoiled. 20:50 jonadab THough, of all the things our government spends tax money on, libraries are a long, long way from being the most wasteful. 20:50 jonadab Good libraries are useful to almost everyone. 20:55 jonadab That varies from state to state. 20:56 jonadab Currently, the Ohio state government is in the process of deciding that for Ohio libraries (and a number of other budget categories). 20:56 jonadab OLC is of course engaged in political maneouvers in an attempt to convince them not to cut the PLF at all. 20:57 jonadab I have no idea what may or may not be going on in other states. 20:58 jonadab But I don't imagine it would change our ILS plans either way at this point, because what we're planning is to move to Evergreen, and that will actually save us money, though that's not the main reason we want to do it. 20:59 jonadab We might go in with a consortium, for Evergreen purposes. That remains to be decided. 21:02 FreddyEnrique Im trying to get used to this term... Consortium. Basically, it is a group of libraries right? That allows libraries to share resources and have a sigle OPAC. Am I right? 21:15 bshum FreddyEnrique: Maybe we can help. What have you been trying so far? Do you have a link to the instructions you're following? 21:18 bshum Yep, sounds right. 21:22 bshum So were you able to get to the end of the OpenSRF instructions where you do the math test? 21:22 bshum And that was successful? 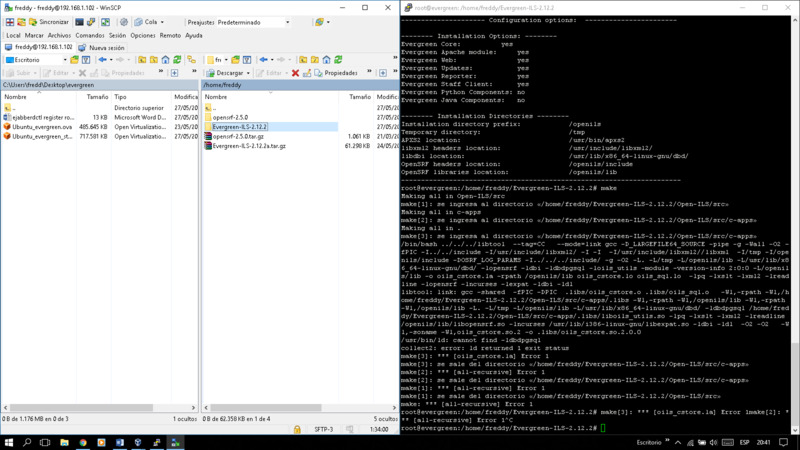 21:25 FreddyEnrique with... make -f Open-ILS/src/extras/Makefile.install ubuntu-trusty command? 21:26 bshum What's that error say? 21:29 bshum Hmm, well that's not good. 21:31 FreddyEnrique maybe is the instructions? 21:31 bshum You ran make -f Open-ILS/src/extras/Makefile.install ubuntu-trusty command as root right? 21:31 bshum While inside the Evergreen-ILS-2.12.2 directory? 21:32 bshum I don't think it's the instructions; they're pretty well-tested these days. 21:32 FreddyEnrique I wish I could uppload a screenshot to describe it. But yeah. 21:33 FreddyEnrique can I uppload it here? 21:33 FreddyEnrique how can I show you my screenshot? 21:44 bshum No worries, that does seem pretty explanatory to me. 21:46 FreddyEnrique you mean... form the opensrf part? 21:46 FreddyEnrique Then...I just redo that step? 22:11 bshum There was a complaint also where somewhere during the make install, it said to run "aptitude remove libdbi0" ; not quite sure what that's about yet..